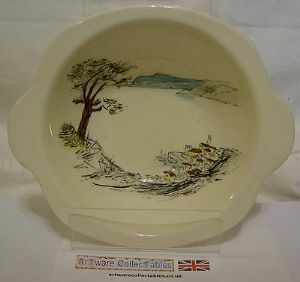 An excellent opportunity to acquire up to 8 Riviera design bowls manufactured by the Midwinter Pottery. Manufactured during the 1950s, these Tableware pieces were designed by Sir Hugh Casson exclusively for Midwinter's Cannes and Riviera range. This Bowl measures just about 6 inches (15 cms) in basic diameter though the two handles add a further 1 inch (2.5 cms) to the maximum width of the bowl. The 6 bowls are in excellent condition with no crazing on any. There is a little evidence of tiny pinprick brown flecks on 3 of them . I would be willing to discuss an overall cost for any number should any buyer be interested in 6 pieces. Otherwise, I shall sell as individual bowls as and when.